Schematic illustration of a standing Alfvén wave (also known as a kinetic-scale field line resonance), in Earth's magnetosphere, with indications of the electron dynamics superimposed. The magnetic field lines are shown in grey, while the red curve indicates the perpendicular electric field profile of the wave. Yellow arrows indicate the motion of electrons in the direction parallel to the magnetic field; dashed loops at the base of each arrow illustrate that the electrons are simultaneously gyrating around the field line. The solid elliptical loops illustrate the trapping of electrons along the field line that can occur at certain points within the wave structure. The approximate positions of ESA's Cluster and NASA's Van Allen Probes spacecraft are also shown. They refer to the positions on 26 February 2001 (Cluster) and 1 June 2013 (Van Allen Probes) when kinetic-scale field line resonances (KFLRs) were observed from both missions when on the same field line and under similar magnetospheric conditions. Combining these measurements, scientists have revealed how electrons interact with these KFLRs. 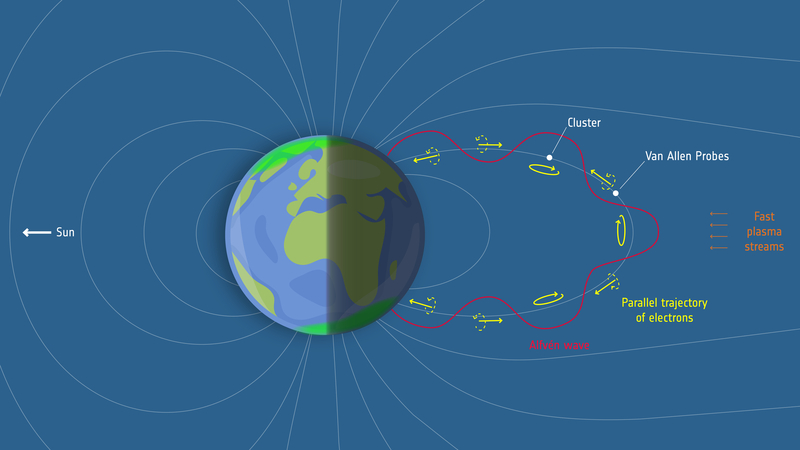 The observations showed that the distribution of electrons within these waves can become stretched in the direction of Earth's magnetic field, and by comparing these with computer simulations, it became clear that the stretching was caused by the trapping of electrons within the standing waves.